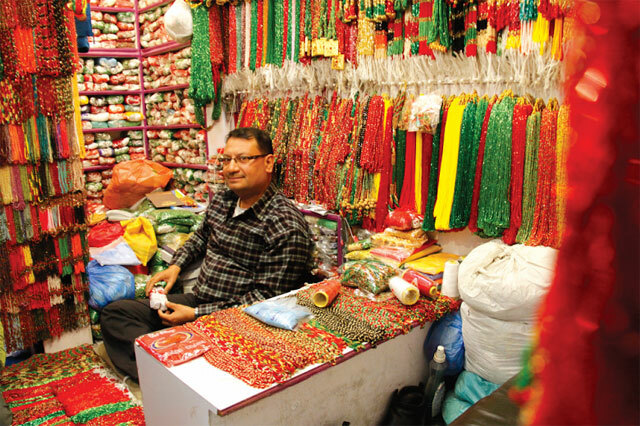 GREEN AND RED: Mohammad Ashraf, 47, is the sixth generation tending his bead and bangle shop in Indra Chok. On a bright morning this week, Ayesha Banu greeted her first customers of the day at her sidewalk bead and bangle shop in Bhaktapur's Sukul Dhoka. Pratikshya, a 28-year-old lawyer, was there with her mother sampling green glass garlands with gold pendants. A Hindu woman buying from a Muslim vendor a necklace of glass beads made in the Czech Republic in a town in Nepal shows just how harmoniously Muslim merchants have assimilated into society here. “I’m the sixth generation of my family in this business,” said Banu, 23. “From the time of my great great grandfather we have been stringing beads here." Banu’s ancestors first came to Gorkha in the 18th century as gunpowder makers for the Shah Kings, and later migrated to Bhaktapur. Today, from her attire and looks, Banu is indistinguishable from the Newar inhabitants of a street bustling with traders, shoppers and tourists. Ayesha Banu does brisk business at Bhaktapur's Sukul Dhoka. After her father left to work in Saudi Arabia five years ago, her mother taught her to string beads. 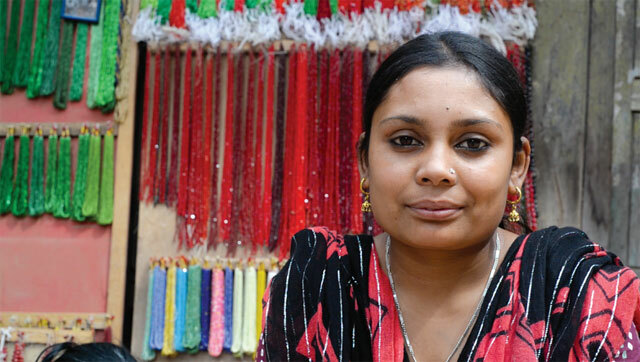 “It took me some time to master the skill, but now I can make a potey (glass bead necklaces) in five minutes,” she said, as her mother Hamidun Nisa Banu attended to Pratiksha who has been buying necklaces from the Banu family for years. Muslim merchants are known as churoute (from the Nepali word for bangles) and have sidewalk stalls near the Darbar Squares of Kathmandu, Patan and Bhaktapur. There are about 10 bead, bangle and hair braid shops at Bhaktapur’s Sukul Dhoka, 35 vendors in Indra Chok in Kathmandu and a dozen in Patan’s Mangal Bazar. “The location of these shops near Malla palaces proves that Muslim traders had good relations with the local Newar community and the king,” explained Rajan Joshi, 41, a lecturer at Tribhuvan University. Ferozuddin Khan, 75, has been tending his chura-potey-dhago shop for 50 years. His ancestors came to Nepal 16 generations ago during the Malla period. Ashraf, 47, is the sixth generation tending the shop located in a bazar established by Prithvi Narayan Shah after his conquest of Kathmandu 250 years ago. Despite this proud heritage, however, the Newari Muslim identity is at a critical transition. 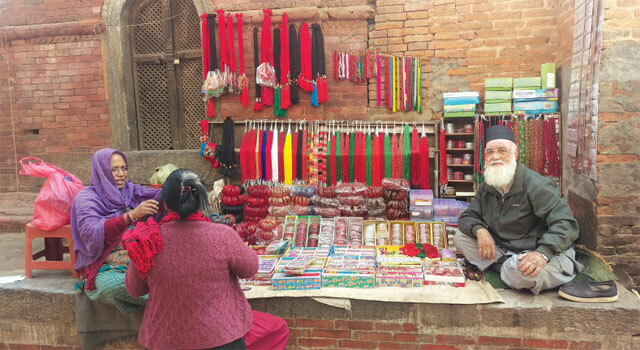 Mohidin Khan, 49, decided to write a history of Nepal’s Muslim merchants because his ancestors were too busy and the younger generation is also not interested. His book chronicles the history of Kathmandu’s Newar Muslims with socio-anthropological and linguistic records. 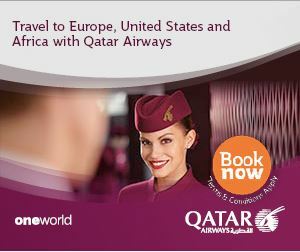 It includes the story of Begum Hazrat Mahal, the Queen of Awadh, who sought asylum in Nepal after the Mutiny in Lucknow. 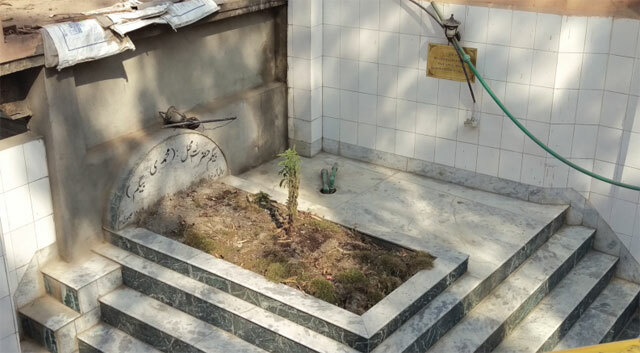 She died in 1879 and is buried at the Jame Masjid in Kathmandu. In his flowing white beard, Ferozuddin Khan attends to a bangle customer next to Patan’s Krishna Mandir. The 75-year-old has been tending the shop at this exact spot for the last 50 years, but says none of his six sons and one daughter are likely to carry on in the business. “I’m the 16th generation doing this, and it used to be my mother’s shop. I open it every day from 10am till 6pm except for big Muslim holidays,” said Ferozuddin Khan, whose ancestors were invited to Patan by the Malla kings. The Newar Muslims are now concerned about rising intolerance by new settlers in Kathmandu, who tend to look down on them. However, losing their jewellery business doesn’t just represent the disappearance of a livelihood and heritage, but also the harmony they enjoyed with the local Newars of the Valley that took centuries to nurture. From 15th century, Muslims from different parts of the subcontinent and Tibet migrated to Nepal trading in glass beads, bangles, gunpowder, perfume, and textiles. The major settlements of Nepal’s Muslims, mainly Sunni, are in the Tarai, in Palpa, Syangja, Gorkha districts in the hills, and Kathmandu Valley. 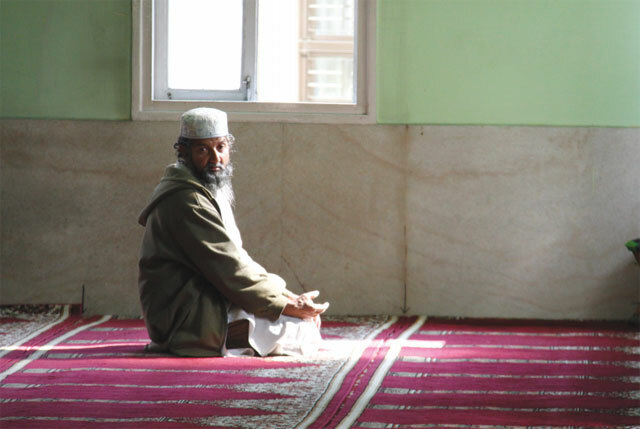 The Muslims of Kathmandu Valley have three main origins: Kashmiri, north Indian, and Tibetan. According to the Vamshavalis, the oldest chronicles of Nepal’s ancient history written during 14th century, Kashmiri Muslims arrived during the reign of King Ratna Malla (1482-1520). They built a mosque, the Kashmiri Takia, and worked for Nepal's kings as Urdu scribes to correspond with the Delhi Sultanate, scent manufacturers, musicians and bangle suppliers. Some were admitted as courtiers to the Malla Durbar, and many traded with Tibet. The north Indian group entered the Valley in Pratap Malla's reign (1641-1674) and during the 16th and 17th centuries mainly fleeing Moghul incursion. They were allowed to build new mosques like the Nepali Jame Masjid in Kathmandu. Muslims from northern India were also invited by hill rulers to manufacture military hardware including cannons and later as makers of agricultural implements, utensils and ornaments. Some Muslim descendants of north Indian migrants are known as the churaute (bangle-seller) and many are farmers. Muslims from the north migrated to Nepal from Ladakh and other parts Tibet, mainly arriving after the Chinese annexation of Tibet in the 1950s. Another wave of Bihari Muslims settled in the eastern Tarai after the Bangladesh war in 1972. Muslims in Nepal officially make up 5 per cent of the total population, but members of the community claim their numbers are double that. 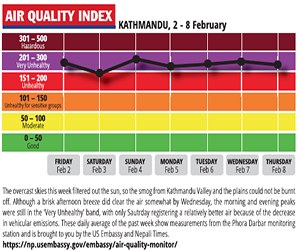 Either way, they still do not have a proportionate say in Nepal’s political structure. 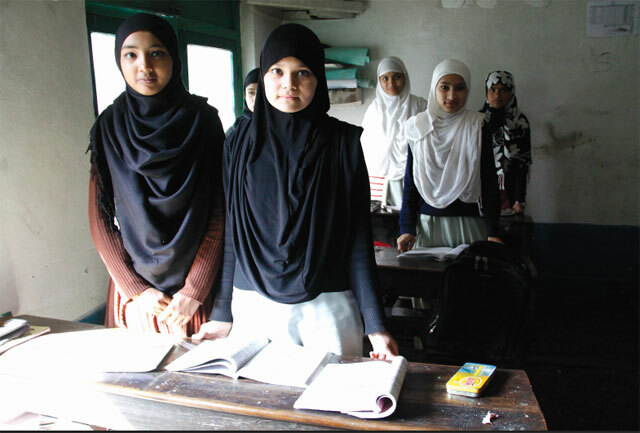 Historically, Nepal’s Muslims are descendants of those who migrated in waves from northern India, Tibet and Ladakh, and more recently from Bangladesh. Even compared to Nepal’s other minorities, Muslims were treated as underdogs. Women who shopped at Muslim bangle shops had to wash their hands when they came home. “Until 30 years ago Muslims were regarded as untouchables together with Christians. 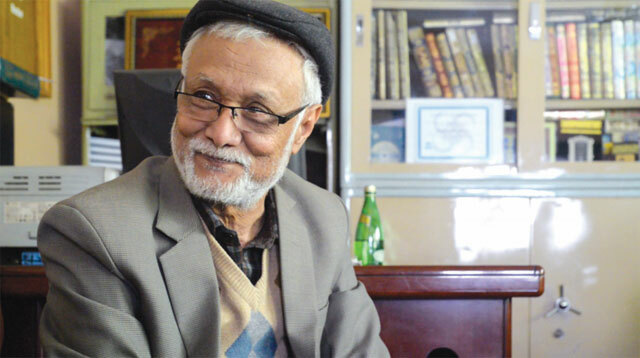 We were the outcasts of mainstream Hindu Nepali society,” said Rahmat Khan (pic above), 63, a medical doctor educated in Cairo’s Al-Azhar University and chairman of Madrasa Islamiya School in Kathmandu which has 390 students until Grade 10. Rizwan Ansari, the central committee member of Upendra Yadav-led Federal Socialist Forum-Nepal and Mohammad Aftab Allam , the ex-chairman of Rautahat working committee of Nepali Congress are the most prominent Muslim names in Nepal’s political arena today. "It isn't easy to launch yourself to a high level appointment without political party affiliation in a culture of political patronage. And I never had that," said Mohna Ansari the member of National Human Rights Commission and the only female attorney from the Muslim community in Nepal. The word ‘Muslim’ appears exactly six times in the new constitution and alongside mentions of other traditionally discriminated groups like women, Dalit, Adivasi, Janajati, Madhesi and Tharu. “You can write anything about Muslims but please don’t touch the political part. We suffered a lot in history, but we do have hope about the new constitution that guarantees equal rights to all Nepalis citizen despite ethnic, religion and gender,” said Khan.